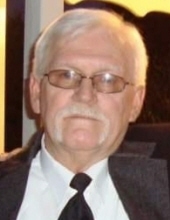 Celebrating the life of Lonnie Gene McKinzie, Sr.
Obituary for Lonnie Gene McKinzie, Sr.
Lonnie Gene McKinzie Sr., 71, passed away on Thursday, January 10, 2019 at his home in Glencoe. Memorial service will be held on Tuesday, January 15, 2019 at 2:00pm at Center Church, 1571 Cimarron Plaza, in Stillwater. Dighton Marler Funeral Home is entrusted with arrangements. Lonnie was born on May 5, 1947 to Carl R. and Nova (Layton) McKinzie in Stillwater, Oklahoma. Lonnie grew up in Locust Grove and later moved to Stillwater were he went to high school. After high school Lonnie married Helen Stigers on April 26, 1965 in Stillwater. Lonnie loved his horses and MULES. He was an avid guitar player and loved singing and playing his guitars. His family was extremely important to him and loved every second he got to spend with them. He loved all his friends and he loved God. Lonnie is preceded in death by his parents, brother Roy McKinzie and great granddaughter Jenna McKinzie. He is survived by his wife Helen, his children Lonnie McKinzie Jr. and wife Cheryl, Shelia Bumgarner and husband Tommy, Carl Shane McKinzie and wife Morgan and Erica McKinzie. He is also survived by grandchildren; Jeremy McKinzie and wife Jessica, Amber Selvey and husband Tyler, David Weaver, Travis Weaver and wife Jennifer, Sara McKinzie, Nathan McKinzie, Caitlyn McKinzie, Gabryel McKinzie and Isaiah McKinzie as well as 8 great grandchildren. Memorial contributions can be made in his name to Physicians Choice Hospice c/o Dighton Marler Funeral Home, 5106 N. Washington St., Stillwater, Oklahoma 74075. To send flowers or a remembrance gift to the family of Lonnie Gene McKinzie, Sr., please visit our Tribute Store. "Email Address" would like to share the life celebration of Lonnie Gene McKinzie, Sr.. Click on the "link" to go to share a favorite memory or leave a condolence message for the family.